This limited-edition bourbon was created from 93 barrels spared by a 2006 storm that swept through Buffalo Trace Distillery, damaging historic Warehouse C. Exposure to sun and weather while repairs were made increased the rate of evaporation – the so-called “angel’s share” was 63.9 percent! But what did that do to the flavors of the remaining bourbon? Let’s find out. Aroma: Cedar, wintergreen, nutmeg and other spices. The nose is sweet and spicy, very inviting. Taste: Very spicy up front – it makes your lips tingle – but that quickly smooths out. 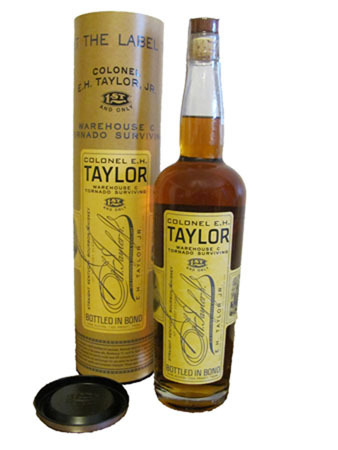 This bourbon is sweet and buttery with a “thick” mouth-feel, almost syrupy. Nutmeg and cloves keep it from being too sweet, though. Considering the age of the bourbon (from 9 years to almost 12) and the increased heat it was exposed to, I expected a heavy oaky flavor, but my palate detected very few of the wood notes here. Verdict: Yum. This is one fine bourbon. I can see why the angels took more than their share, but I thank them for leaving a little bit for us mortals. Seek this out while you can!